Christopher Rouse (b. 1949) is one of America's best known and most frequently played composers who was named "Composer of the Year 2009" by Musical America. He studied with George Crumb and Carel Husa. Since his DMA in 1977 Rouse has balanced busy composing career with teaching. He currently serves on the faculty of New York's Juilliard School of Music. Rouse composes primarily orchestral music, an arena in which he has been unusually successful. Nearly every major orchestra in the world has programmed his works. 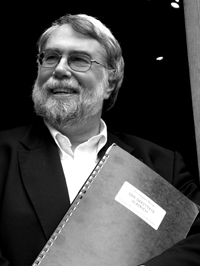 After winning the 1993 Pulitzer Prize in Music for his Trombone Concerto (1990-91), he produced a bumper crop of concerti, including the Violin Concerto and percussion concerto 'Der gerettete Alberich'. His guitar concerto 'Concert de Gaudí' earned Rouse a Grammy Award (Best Contemporary Composition) in 2002.